I just learned about an interesting product in my online painting group. 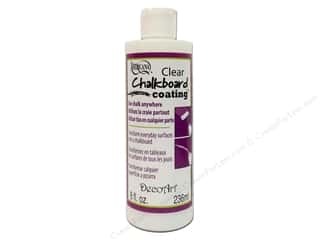 It is Decoart's Clear Chalkboard Coating. Apparently, you can create a chalkboard out of many surfaces. Seems to be a neat idea. I decided to order some and give it a try. You just never know until you try a product, as to how well it really works. You are suppose to be able to coat over other painted surfaces to create a chalkboard effect. My thoughts are if it really works well, this could be a great way to create neat wedding favors. I plan to experiment once I receive the product. I will report in with projects and their results soon. If you have used this product before, I would love to hear your thoughts.